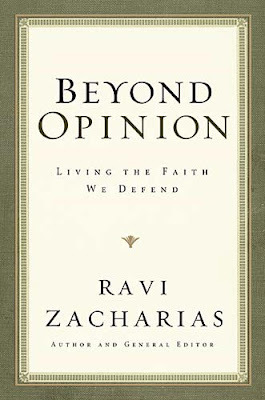 This month, for our bookclub, we're reading Beyond Opinion , by Ravi Zacharias. I chose Beyond Opinion , by Ravi Zacharias because I've been meaning to read it and I know that once I start, it will require dog-earing, highlighting and underlining. I will be going back over passages and re-reading many paragraphs and being held accountable by the book club, which will help me persevere! Zacharias didn't actually write the whole book; the chapters are by different people. I flipped to the back of the book and read "About the Contributors" to help me understand each person better as I read. I have read several RZ books. Jesus Among Other Gods is my favorite so far. 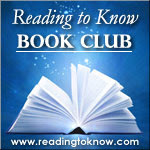 I am eager to get started and will be posting on a regular basis on my book blog: Peace, Love and Books. "My prayer is that you will be blessed and equipped as you study these pages. This may not be a "read-through" book that can be absorbed in a single sitting. But I suggest to you that is is a "must-read" book for our times." Welcome New Year! Let's read! You have until Friday, January 27th to read this book. At that time I will post the concluding post for the month of January. On the 27th you will be invited to link up your post/share your thoughts on this title. I look forward to seeing what everyone has to say about this one at the end of the month! I'm about 4 or 5 chapters in and learning a lot! This is one I probably would've never gotten around to reading on my own, so thanks, Carrie and Sky! Glad you picked it, Sky! I've always liked Zacharias but its been awhile since I've read one of his books. Looking forward to digging in! If only I had the time -- this would have been a great addition to my January reading! I might join in with the book club choice during a later month. He makes me think which makes my head hurt. So I'm sticking with Montgomery this month. :) But I look forward to reading what everyone else learns. I have it--in my book bag along with two other books I'm reading right now! Haven't started it yet, but will by this weekend. Fun, fun--love a challenge! This looks really interesting. I find myself hungry for challenging reads about "the faith" these days, so I'm going to try to look this one up.